Hey,there. I am making this for my mom...Its a early Mothers Day gift. She loves sewing machines. And this was perfect for her! Thank you for sharing your amazing pattern. It was easy to follow! 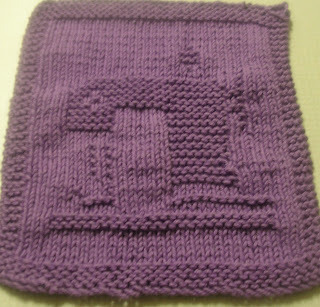 I have knitted the dishcloth for a penpal. You're welcome, I am glad it went well for you. By the way, I love your name, very pretty. My sister loves bubblegum machines. I made the washcloth in pink. It is adorable and she I going to love it. Thank you for the beautiful pattern. Now I am going to do the sewing machine for my sister who is a quilter. Thanks carol, I am glad that you are liking them. Have a great day!